Sail Aid UK, set up in September in the immediate aftermath of Hurricanes Irma, Jose and Maria wreaking violent havoc across so much of the Caribbean, reports that its first major fundraising platform, the Black Tie/Loud Shirt Dinner at Land Rover BAR's Flight Deck in Portsmouth on 11th November, was virtually sold out within days of announcing it, however there are still a limited number of tickets available. Booking enquiries to: simon@sailaiduk.com. In addition to take-up for the gala dinner and some incredible online and live auction prizes being sourced, there has been fantastic personal support for from the pro-sailing community for the Sail Aid UK cause including Sir Ben and Lady Georgie Ainslie, Ian Walker, Shirley Robertson OBE, Helena Lucas MBE, Hannah Mills MBE, Sam Davies, Dee Caffari, Brian Thompson, Alex Thomson, Andy Beadsworth and many others. Funds raised from the dinner, organised and hosted by Sail Aid UK, are anticipated to be in the region of £100,000. The evening is kindly being supported by Land Rover BAR, Opihr Gin and Westerhall Rums. The Master of Ceremonies is broadcaster and sailor Hannah White who has generously given her time and the organisers are also indebted to Nick Bonham who is also kindly contributing his superlative auctioneering skills to up the anti in the room and raise as much as possible. In tandem with a new Sail Aid logo designed by Hannah Webster there is now a purpose-built website at www.sailaiduk.com, courtesy of Jeremy Pocock, Sailing Club Manager, which includes the all-important 'Action Stations' fund channel. Click https://www.sailaiduk.com/page/how-to-help to donate. 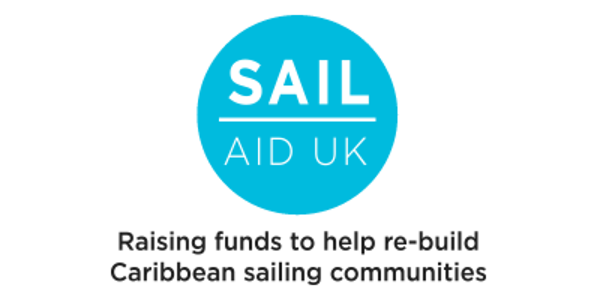 The Trustees of Sail Aid UK, which is still awaiting charity status owing to a massive backlog of applications, has decided that for now, funds will be targeted at, but not limited to, regeneration projects being funded through Virgin Unite, ABSAR (Antigua and Barbuda Search and Rescue) and the Anguillan Red Cross. The Sail Aid UK team is in contact with people on the ground in the affected areas to ensure that the money will be used for the most appropriate projects once the immediate requirement for humanitarian aid support has reduced. Anyone who has ever visited the Caribbean won't fail to be moved by the Sail Aid UK call to action video, generously provided by Red Handed TV and with a soulful voiceover by Hannah White. A social media campaign running with the theme of I'm In! #sailaiduk has really gathered pace and anyone who donates to Sail Aid UK can now send in a photo of themselves holding up this message (written clearly please!) and it will be added to the website's Sail Aid UK Action Stations supporters gallery.